Shopping for My Little Pony Mini-Figures? Collect your favorite ponies from My Little Pony: Friendship Is Magic and beyond! 6-pack contains 6 My Little Pony figures. Which ones will you get? It's a surprise! Each figure includes a card with the pony's name and fun facts about her (or him)! If you can't get enough My Little Pony fun, then My Little Pony Blind Bags are just the thing for you! Each figure is individually packaged and comes with a card that includes the pony's name and some fun facts about her. Collect your favorite ponies from My Little Pony: The Movie and beyond! Figures measure approximately 2-inches tall. Ages 3 and up. 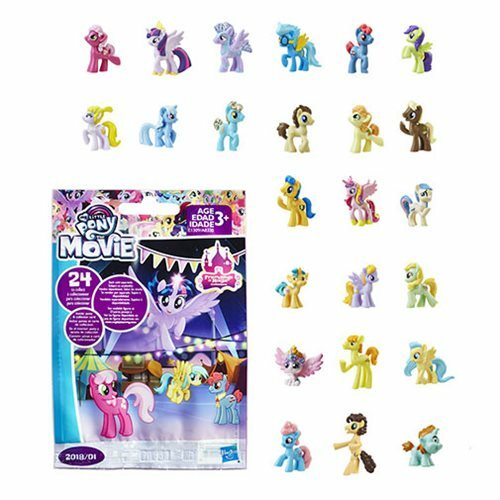 This My Little Pony The Movie Blind Bag 2018 01 6-pack contains 6 individually blind-packaged 2018/01 ponies.